A Dozen Quick & Easy Recipes for healthy yet satisfying sweets. You don’t see the words healthy & sweet used together too often, right? Not nearly enough for me… Healthy Sweets are unfortunately found few and far between. If your sweet tooth is bothering you and you are trying to eat healthy (and thus don’t keep candy in the house), then we have a few suggestions. Here are a dozen quick and easy combinations that are healthy, yet sweet enough to provide a little satisfaction. 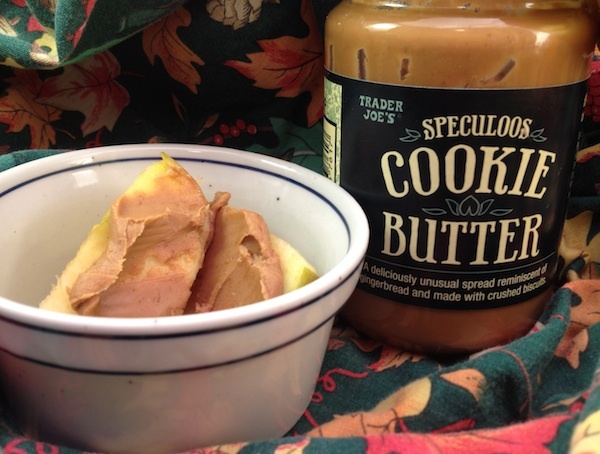 We were at a Trader Joe’s one day and noticed a sign saying “Cookie Butter – Limit 3”. The sign accompanied a completely empty shelf. Having never seen a quantity restriction at Trader Joe’s, we were intrigued as to what this new product was. Our quest began and after checking a few more stores, we finally found some. After reading the ingredients (mostly sugars and oils) we hesitated whether or not we wanted to try it but eventually gave in to our intrigue. Although the initial reactions of just licking some off a spoon were a bit mixed… everyone continued to lick their spoon until clean! It’s a sweet gingerbread type taste with a somewhat granular yet very smooth consistency. Then we smeared some on a slice of a cold Johnagold apple… WOW… instant apple pie in your mouth!! Since apples are great for you and doctors encourage eating an apple a day, I have to admit we all ate more than one apple that day! We figure little dabs of this cookie butter pales in comparison to eating an actual slice of apple pie. The only thing these healthy cookies lack are added fats and sugars. All ingredients are good for you and there’s nothing on the do not touch list. The flavor is great (although not super sweet and gooey) and they should satisfy your sweet tooth without giving it a cavitiy. They are denser than most cookies, which generally contain lots of butter or crisco, and make a good choice for a breakfast cookie. Optional items: 1/4 C of any of the following – peanut butter, chopped nuts, dark chocolate chips, and/or coconut. Mix the above ingredients, scoop onto non-stick baking sheet (flatten if you prefer a crisper cookie) and Bake 350° for about 15-20 minutes. 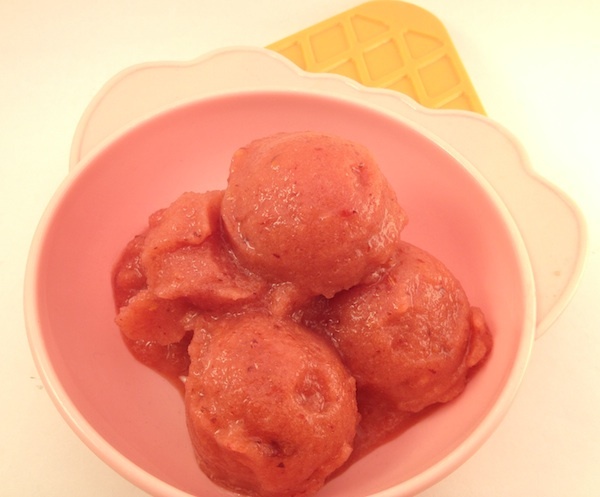 Sorbet sounds fancy, but it is quick and easy to make and even easier to enjoy as a healthy sweet. Just take your favorite fresh fruit and throw it into a sturdy blender with plenty of ice and a squeeze of honey. Strawberries, peaches, oranges and mangos all work great as fruit choices. Eat the sorbet right then for immediate satisfaction. For a creamier treat (more like ice cream) blend frozen fruit with yogurt and a small amount of juice. 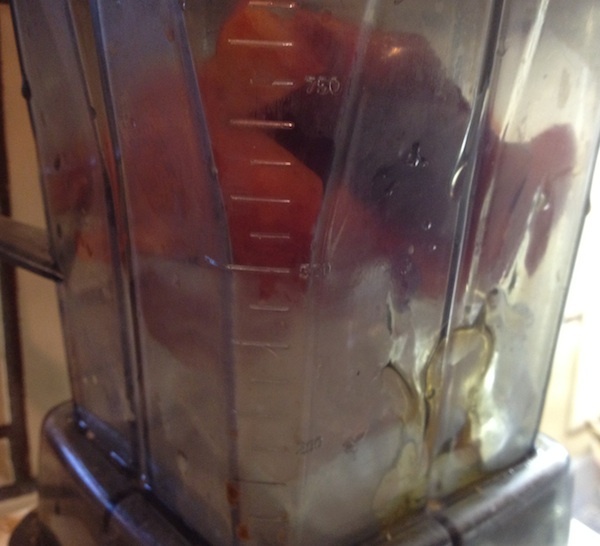 Frozen items will burn out most blenders, so be sure you have one that can handle the load. Leftovers can be placed in an airtight container in the freezer for later but the consistency will be hardened. Since Halloween is approaching, make pumpkin brownies. Just mix a brownie mix package with a can of pumpkin and a teaspoon of pumpkin pie spice to make Pumpkin Brownies. No oil or eggs are needed – just those the 3 ingredients. Make your brownie mix better for you by using a can of pureed black beans instead of the oil and the eggs. Other options to replace the required oil include pureed apricots, plums, applesauce or yogurt. Dried Fruits also make a tasty and chewy healthy sweet. Beware of the label because some have added sugar. 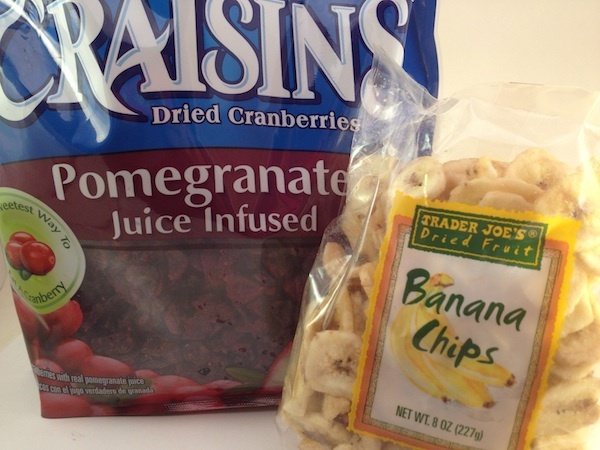 Banana chips are especially crunchy and make a nice healthy sweet. Popcorn is always a healthy snack, but it is not considered a healthy sweet. Kettle Corn can be easily made by getting some oil (about 1/4 cup) hot in a heavy pan and then stirring in about 1/4 cup sugar before adding about 1/2 cup of popcorn. Cover and shake often until the popping almost stops. This kettle corn costs pennies compared to what’s sold at the county fair! If you want to just slightly sweeten your popcorn then try making regular popcorn and then sprinkling with cinnamon and nutmeg after popping instead of butter – bam healthy sweet. 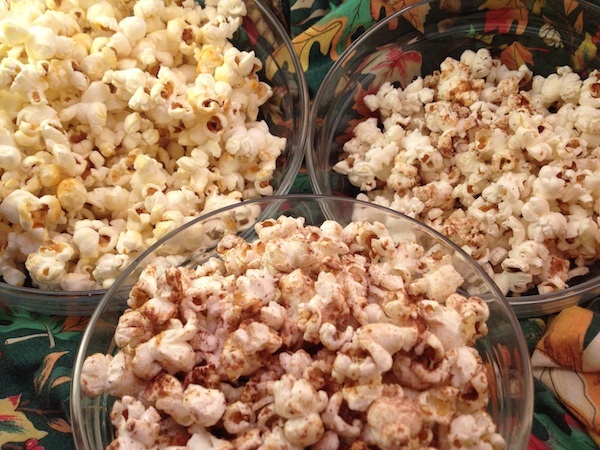 Or, while the popcorn is still hot mix in some peanut butter and cocoa powder. Woops – I noticed when I took the picture that my popcorn was well over it’s best by date! It popped up beautifully (only a few kernels remained un-popped) just like fresh and it tasted exactly like it should. For more information on how long popcorn lasts, check our popcorn page. Brown some nuts (almonds, pecans or walnuts work well) in a tiny bit of olive oil (or butter, which tastes better but not as healthy) over very low heat for 6-8 minutes stirring a few times. 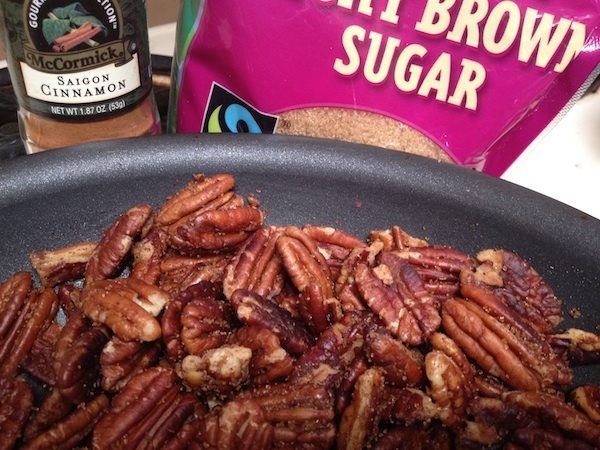 Then sprinkle a little brown sugar and cinnamon on them and cook for another 1-2 more minutes. Candied nuts are one of the more nutritious healthy sweets you can eat plus they are both economical and easy to make. A classic taste – just break off a piece of a dark chocolate and dip it in peanut butter. A healthier sweet than a Reese’s peanut butter cup and more likely to be in your cupboard. Or, try this easy Fake Fudge Recipe: Just empty a jar of dry roasted peanuts (unsalted) in a sturdy blender or food processor and add some pieces (about 3/4 of a cup) of dark chocolate (or semi-sweet chocolate chips). Blend. Then place it in a sealed container in the fridge. 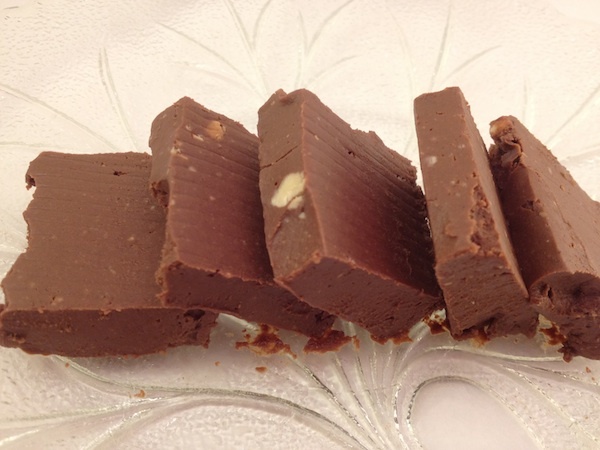 You can slice the refrigerated product and it looks just like fudge but tastes creamy and fantastic. 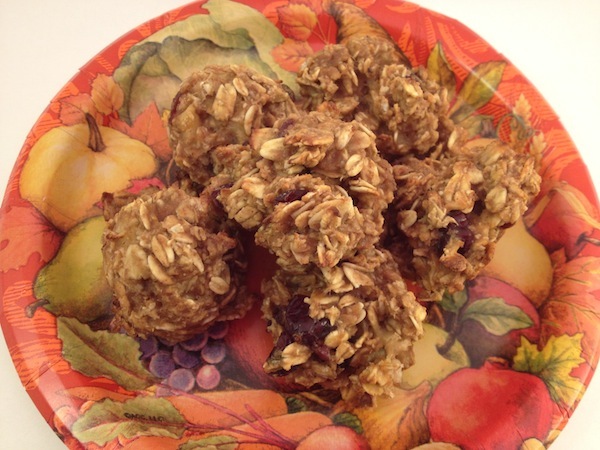 Unbelievable that it’s that easy and is made entirely with recommended healthy snack foods! Just remember not to eat the whole tray in one sitting! 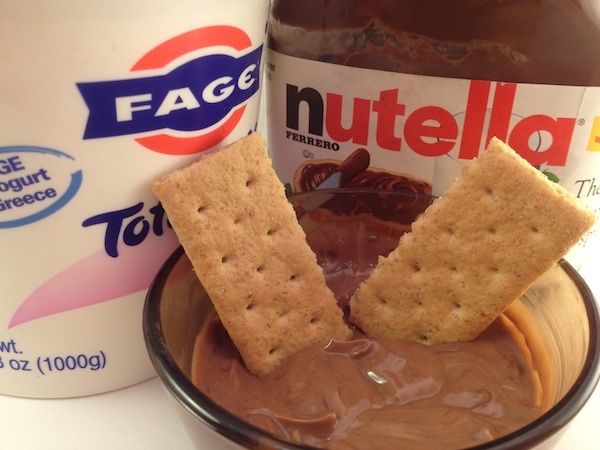 Mix some Nutella into Greek or vanilla yogurt and then use as a dip for fruit, graham crackers or animal crackers. Peel a banana and pierce a stick through the middle. 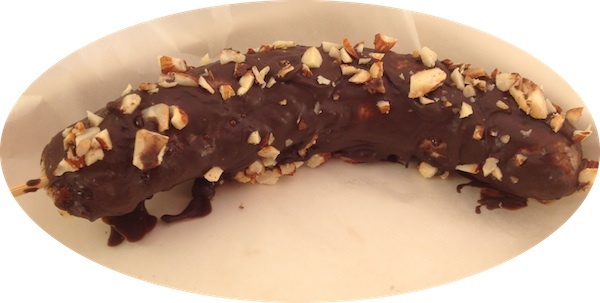 Then cover the banana with melted dark chocolate and immediately roll it into chopped nuts or granola. Freeze them on a wax paper lined cookie sheet. Wash, dry and freeze grapes separately. Especially good popped in your mouth on a summer day. Dark chocolate covered strawberries or any fruit which takes a quick dip in dark chocolate makes a fresh and healthy sweet that packs vitamins and antioxidants. They are also easy to make using a microwave, just follow the directions in this link.